You helped provide a miracle! But there are so many more who need help. 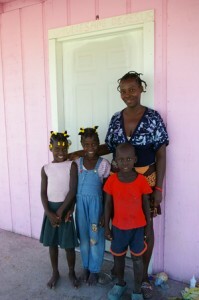 Your gift today will continue to give the people of Haiti a future and a hope. With the larger center, our partners on the ground will have the ability to take more food to rural and isolated villages where the need is greatest. Thank you for caring for the poor and helping us complete this much needed Distribution Center. As we feed these starving little ones, we also teach their families how to and make life better for their children and grandchildren. Most importantly: They learn about Jesus, the eternity-changing Bread of Life! Please do your best . . . help us finish the job. Haiti is a harsh place for children. Most have little to eat . . . not even one meal a day, much less three. Starving children try to dull the pain of hunger by eating rocks, sticks and even dirt. Malnourishment often turns their beautiful black hair to a lighter reddish tint. 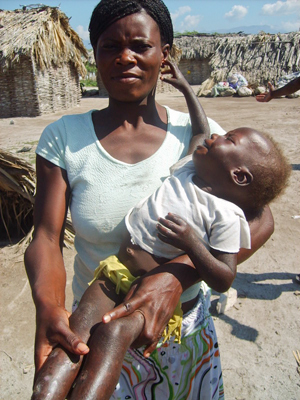 Mothers who don’t have enough to feed themselves cannot give their babies enough milk and nourishment. 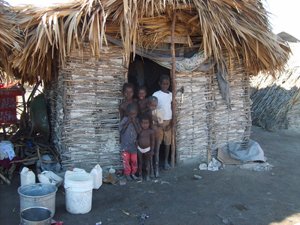 Your gifts are making a difference in places like Kingdom Connection Village but there are thousands more in remote areas that need help. Your generosity today will make a big difference. For two years now we have helped provide hundreds of thousands of meals each month to starving men, women and children. We have built homes for the homeless. We have shared the eternal hope of the Gospel to the hurting. And we have provided medical help, training and more.Your compassionate support is literally saving lives and transforming eternity for a people who have been devastated by natural disasters and extreme poverty. And now, God has given us the opportunity to impact even more lives. In the past weeks and months generous friends like you have given to help build a much-needed, larger DISTRIBUTION CENTER to gather more food and supplies for the hungry and keep it all safe from weather conditions, thieves and rodents. Now, we are almost there! We are so close to accomplishing our goal. And I want to invite you to be a part of what God is doing.